President Bob welcomed all and called the meeting to order. He spoke about the upcoming Area 3 Holiday Party which will be held at Emilio’s on Decembe 8, 2017. Save the Date - final details are pending. December 15 will be the Annual Meeting where the Nominating Committee will be in place to accept volunteers for next year’s posts. He encouraged all to step forward to be part of the Board and to serve as Directors. Mentioning that issue. membership is a very common problem in organization and cited that Rotary Clubs are one of the best run organizations around. He introduced Mary Ricketts who is the President of the Rye Chamber of Commerce. She explained that business professionals now comprise more positions in the Chamber, as there are more businesses coming into Rye. There are, however, less retail businesses represented. Their mission is to keep a beautiful and pleasant business atmosphere in Rye. Special events as “Best in Rye” are conducted to promote their businesses. The well-known “Sidewalk Sale” is also done and thoroughly enjoyed. A wonderful Rye time is had at Misletoe Magic that includes the well-received “Chili Contest” that is conducted as a fundraiser for the Chamber of Commerce and raises approximately $3500, which goes towards scholarships awarded to deserving students. She went on to talk about the making of “Scarecrow” contest to bring people back to town after the long year of construction which obstructed traffic flow badly. Also, The Farmers Market is a very popular event as well. She spoke of the “healthy mix” of stores in Rye and indicated that Rye has the lowest vacancy rate in Westchester. She closed by mentioning the developing of a Master Plan Committee. The Raffle was won by our guest, Margaret Ricketts! Congratulations! President Jason called the Meeting to order. He welcomed members and guests. The Pledge of Allegiance was cited. Rich Martinelli, who is Chairperson spoke about our“ 2017 Golf Outing” which will be held at : Rye Golf Club on October 12 Rain date – October 19. Committee members: Mehler, Manheimer, Sculti, Dwyer, Ciraco, Kattan. ** ALL ARE ENCOURAGED TO PARTAKE !! $18,000 in scholarships was awarded to students at Rye High School on June 8 by Pres. Mehler. There were 6 $3000 scholarships. CONRATULATIONS GENTLEMEN AND WELCOME TO THE ROTARY CLUB OF RYE ! Please send checks to Jim Jackson and/or pay online. Spouses and guests are welcome and encouraged to attend. Join committees! Stay active and engaged! Motion to approve new prospective members Joel Salomon and Jon Gluck was made, seconded and approved. Date of formal Induction - June 2. 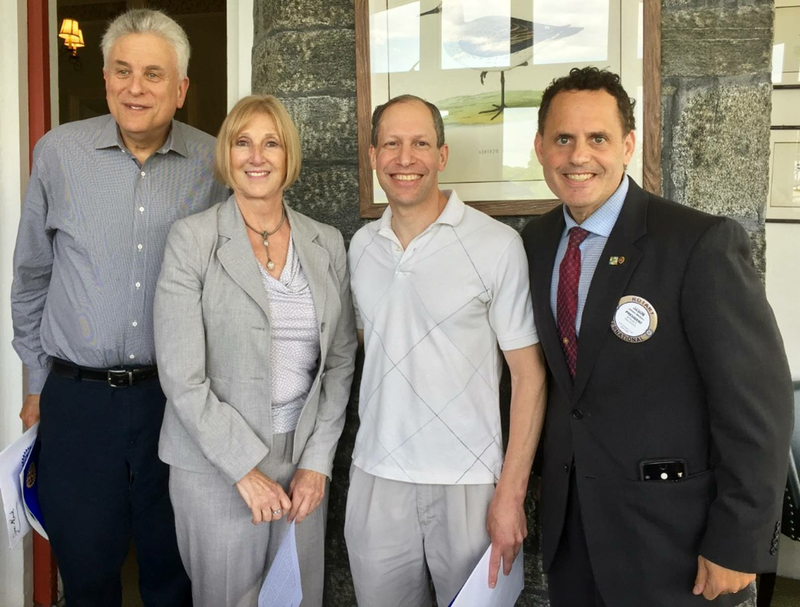 Farewell and thank you to Rye Rotarian Brian Monahan. Guest Speaker - Mentalist Brian McGovern addressed the club and demonstrated methods of improving memory recall.